The Premier League leaders, seeking a single-season record 14th successive win at White Hart Lane, were described as "privileged" by former boss Jose Mourinho, now at Manchester United, for their fixture schedule. And Spurs boss Mauricio Pochettino says everyone wants his side to beat the Blues and end their run. 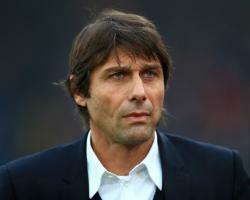 "I can reply that I didn't do the fixtures," said Conte, who became Mourinho's permanent successor last summer. "I think that now they are angry for our position not for the fixtures. I repeat it's always because you stay up (at the top). "Every team wants to stop our run, not only Tottenham. Not one person wants to kill the championship." Conte's Blues matched Arsenal's single-season top-flight record of 13 consecutive victories with last Saturday's defeat of Stoke. And a win at Spurs would draw Chelsea level with the Gunners' record mark of 14 straight wins, which ended in August 2002. For the other situation (the record), it's not important for us. "(But) If you see the table, you can see that we have only five points more than second place, from Liverpool." United are sixth, 10 points behind Chelsea, but nine clear of seventh-placed Everton after six successive wins. It was suggested ending Chelsea's run would exact a measure of revenge for Spurs after the Blues ended their Premier League title hopes last term, handing Leicester the trophy. Conte said: "You don't win and you don't lose a championship in one game." Conte believes Spurs are stronger than last season, mainly due to the addition of midfielder Victor Wanyama and having more time to gel under Pochettino, who "is showing he can be one of the best coaches in the world". I consider Tottenham to be a great team, very strong."